The Perfect Girls Get-a-way: Day 1 – Friday a.m. If you are lucky enough to be able to take the entire day off and start your weekend early, there are plenty of things to keep you busy in Chisago Lakes. After you’ve checked in and settled into your lodging, it’s time to explore the town. And shopping your way through our community is a great way to get a feel for the area and pick up some distinctive items. As you make your way down the street, notice the blue and yellow placards that hang from each store front signed in both English and Swedish. 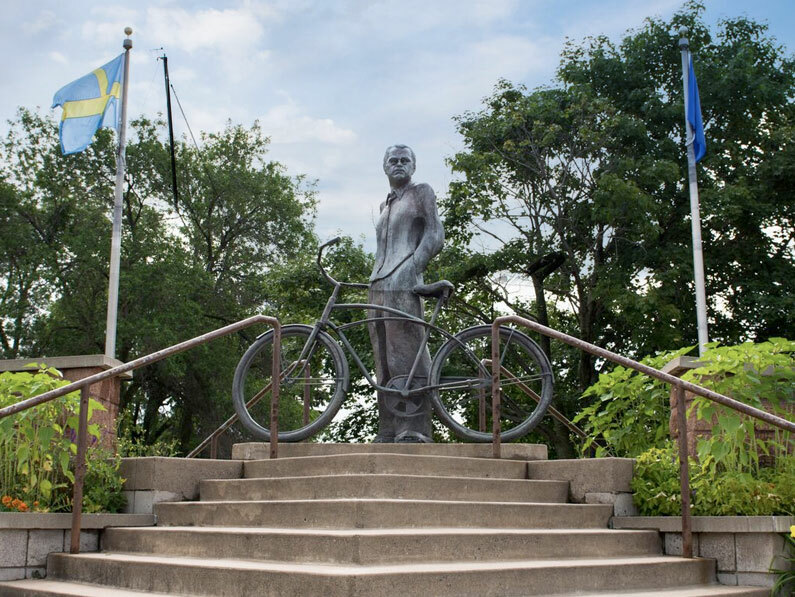 Known as “America’s Little Sweden” and sister city to Tingsryd, Sweden, Lindstrom continues to honor its Swedish heritage. Be sure to stop in at the Lindstrom Antique Mall and Flapper Janes for historic and one-of-kind treasures, The Oven Mitt for kitchen goodies as well as In the Moment Boutique and Skinner’s for fun clothing options. After all this shopping, your senses will appreciate a mid-morning pick-me-up at the Lindstrom Tea Company and The Sweet Swede Fudge Shoppe. Step into the quaint store, and let the scent of chocolate engulf you. For something with a local flare, sample the Lingonberry Fudge. Lingonberry, a tart Scandinavian mountain cranberry, is a traditional ingredient used in many Swedish dishes, from pancakes to ice cream. Across the hall from the Shoppe you’ll find a large knitting store. The owners can help you pick out a project that will fit your skill level. And just down the street, pick out a Chisago Lakes t-shirt or sweatshirt from Gold Star Printworks for your casual-wear collection. There’s still much more ahead of you this day, watch for the next blog update to see what the afternoon holds. The Perfect Girls Get-a-way: Day 1 – Friday p.m.
Now that you are nourished and rested, it’s time to hit the shops again. This time, we are going to head down Highway 8 to Sven’s in Chisago City. This barn-shaped building houses both a factory and a retail store and specializes in original hand-made clogs and purses. If you like exclusive, unique, hard to get fashion items, this is the store for you. Sling your purse across your body, roll up your sleeves and put your phone on do-not-disturb. As the only retail store for these Swedish inspired products, this is your chance to touch, try on, and give in to your temptations. Once you’ve finally filled your fashion craving, it’s time to head to the Farmer’s Market in Chisago City. Held every Friday afternoon, May through October, at Moberg Park in Chisago City, the market offers something for everyone. You’ll find fresh bread and local produce, jewelry, lotions, wool socks and more. Visit Chisago City Farmers Market website here. While you are in the park, you’ll want to take some group pictures. Pose by the statue of Vilhelm Moberg, a famous Swedish author, who traveled the area by bicycle in late 40s. The author wrote an intriguing fictional story of Karl Oskar and Kristina’s emigration from Sweden. You can purchase the series at Gustaf’s Galleries in Lindstrom. Visit Gustaf’s Galleries website here. Be sure to climb up on the oversized Adirondack-style chair for a unique photo. The bright lime-green chair, a part of the “Life is GREAT on Highway 8” promotion, is just one of the five chairs located in each city along the Highway 8 Corridor. Throughout this blog, many of our local restaurants will be highlighted. Explore the website for a full listing of options. It’s been a busy first day. Get some sleep, we have a big day planned for tomorrow!